Regular readers of Geeky Hobbies will know that one of my favorite video game genres are puzzle games. I have always enjoyed the puzzle game genre because good puzzle games do a great job at being challenging while also maintaining a relaxing experience. While I really like the puzzle game genre, a lot of the games in the genre are not highly original and usually use pretty similar concepts. When I saw Iris.Fall though, it looked like a truly original puzzle game with its emphasis on light and shadows which was even translated to the puzzles themselves. Adding in the unique atmosphere, I was really interested in trying out the game. Iris.Fall does an amazing job utilizing the light and shadow mechanic to create interesting puzzles and an intriguing atmosphere. Unfortunately it is a little too easy and short to reach its full potential. We at Geeky Hobbies would like to thank NEXT Studio for the review copy of Iris.Fall used for this review. Other than receiving a free copy of the game to review, we at Geeky Hobbies received no other compensation for this review. Receiving the review copy for free had no impact on the content of this review or the final score. In Iris.Fall you play as Iris. After waking up from a dream Iris spots a mysterious cat staring at her. She decides to follow the cat. The cat leads her to an abandoned theater which transports her to a world of light and shadow. Things are not as they seem though as the items Iris finds in the theater seem to have a hidden connection to her. Using light and shadow to her advantage, Iris needs to find a way to escape the world that she has been transported to. At its core Iris.Fall is similar to your typical indie puzzle game. The gameplay mostly revolves around moving Iris around the game world until you reach the next puzzle. You then need to solve the puzzle in order to advance in the game. 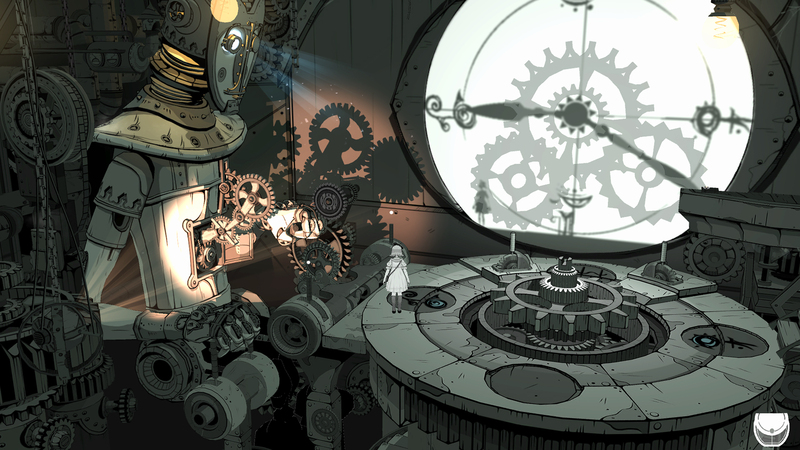 What makes Iris.Fall stand out from other puzzle games is its emphasis on light and shadows. While there have been other games that have used shadows as a gameplay mechanic, Iris.Fall’s puzzles rely almost exclusively on using light and shadows. There are many different types of puzzles that use this light/shadow mechanic including puzzles where you have to place objects in front of the light in order to make specific shadows on the wall. The area where the light and shadow mechanics play the biggest role though are in puzzles where you have to build a shadow path. Iris will regularly encounter magical books that can transport her between the world of light and the world of shadows. When you activate the book, Iris will be transported to the wall behind her which changes the game from a 3D to a 2D world. As Iris can’t jump, the puzzles mostly involve moving things around the environment in order to create a path for Iris to reach her destination. This involves moving objects in the way of the light so they cast a shadow on the wall that Iris can then traverse. I just briefly explained two types of puzzles found in Iris.Fall but there are others as well. I am going to hold back from describing the others though so people can discover them on their own. Iris.Fall’s puzzle design might sound unorthodox but it really works for the game. The game’s puzzle design is the game’s greatest strength. While the game does repeat the puzzle mechanics I mentioned earlier several times throughout the game, it also features many other types of puzzles that make one appearance and then the game moves onto another type of puzzle. What is so great about the puzzle design is that the game does such a great job using the light and shadow idea. The light and shadow idea could have been a gimmick, like most games that use it, but the game does a great job making it more than that. It really feels like the designers decided to make a puzzle game featuring light and shadows and then thought of ways that it could use that idea to create some creative puzzles. Being a fan of puzzle games, I play a lot of different games from the genre. I really enjoyed my time with Iris.Fall because it does such a great job with the puzzle design. The game doesn’t just repeat the same puzzles over and over again with a few slight tweaks. Real effort was put into making each puzzle truly unique. For the most part the puzzles are also quite clever. You have to think in order to solve them which gives you a sense of accomplishment when you figure out what you are supposed to do. Fans of puzzle games should enjoy their time working their way through the puzzles. After the puzzle design, Iris.Fall’s next greatest strength is the game’s atmosphere. For an indie game the game’s graphics/art style are impressive. Instead of going for hyper realism, the game utilizes a more cartoony/cell-shaded style which works really well for the game. How the game utilizes this style along with the light/shadow mechanic makes the game look fantastic at times. In addition the soundtrack/score does a great job adding to the atmosphere. Iris.Fall has a really interesting environment that you will want to explore. While Iris.Fall’s atmosphere is great, the story is a little more hit or miss. I can see some people really liking it and other people not really getting it/liking it. The story is one of those where it is not immediately clear what is going on. The game doesn’t hold your hand and tell you a straightforward story. The story is something that you have to pick up on context clues and you can kind of interpret it how you want. I think some people will really like it and others may not really care for it. I thought the story was solid but it isn’t as good as the world that the game crafts. I really enjoyed my time with Iris.Fall but there are two issues that prevent the game from being as good as it could have been. The first issue I had with Iris.Fall is going to be a bigger issue for some people than others. Maybe it is just because I play a lot of puzzle games but I found Iris.Fall to be quite easy. I would say that most of the challenge in Iris.Fall is figuring out the mechanics and what you are supposed to do for each puzzle. The game doesn’t give you a tutorial for any of the puzzles so you have to figure out how each puzzle works. Once you figure out what you are supposed to do in the puzzle, it becomes pretty easy to figure out what you need to do to complete it. I would say that I only had slight issues with one or maybe two of the puzzles. The puzzle that stumped me the most was a puzzle where I didn’t notice all of the relevant information. Otherwise I was able to figure out most of the puzzle quite quickly. The thing with a lot of the puzzles is if you can’t fully figure out the puzzle, you can always do some trial and error and you will eventually arrive at the answer. I found Iris.Fall to be quite easy but I do play a lot of puzzle games. People who don’t play a lot of games from the genre might find the puzzles a little more challenging than I did. The easier difficulty makes the game more accessible and allows players to spend more effort on the atmosphere/story as you wont be frustrated by the puzzles. If you want a challenge though you may be a little disappointed as the game doesn’t really have any puzzles that will stump you. The biggest issue I had with Iris.Fall was its length. Indie puzzle games are generally not that long. Even though I expected the game to be on the shorter side, I was still a little disappointed. I was able to complete Iris.Fall within 3-4 hours. The biggest issue I had with the length is that I just wanted the game to continue as I was really enjoying it. The game ends kind of suddenly. I would have really liked it if the game was a couple hours longer as I think the game could have done more with the premise. As the game has very little replay value outside of playing the game again from the beginning, most people will probably only get 3-4 hours out of the game. If you like puzzle games, you will really enjoy the time you spend with Iris.Fall. It unfortunately ends too quickly though. At the end of the day Iris.Fall is a good indie puzzle game. The game’s atmosphere and use of light and shadows are fantastic. The game presents an original and unique world that you want to explore. The puzzle design is really good which includes some of the best puzzles that I have seen based around light and shadows. While the puzzles are on the easy side, you get a sense of accomplishment when you solve them. The only significant problem with Iris.Fall is that the experience ends too quickly. The game will take most people around 3-4 hours to complete which is a little disappointing as I didn’t want the game to end. If you don’t really care for the game’s concept or don’t like puzzle games in general, Iris.Fall is not going to be for you. If you want a challenging puzzle game or are a little hesitant about the length, you should maybe wait for a sale. If you don’t mind that the game is on the shorter side though, I would highly recommend picking up Iris.Fall. A creative use of light and shadows leads to some well designed puzzles. The artwork and atmosphere in general is great. Short at only 3-4 hours long. While clever, the puzzles aren't that difficult.